Fight every kind of discrimination, starting with homophobia. In Italy Uisp began of October 22nd, within the framework of Action Week 2011, with a mini football tournament between 4 teams which was organized by Cantiere Giovani, a social cooperative based in Naples. As well as through the "Quindicinale of Silano di Cosenza", which has participated in our initiatives for many years, and this year decided to produce and distribute pamphlets about the realities of homophobia in European sports. Now the next step for Uisp is: the presentation of its Italian campaign. The slogan is: the “differences” in equality. The campaign aims to challenge the stereotypes that exist around LGBT (Lesbian, Gay, Bisexual & Trans) people and work towards a future where the visibility of LGBT people in football is both accepted and celebrated. Because homophobia is still hugely prevalent in both grassroots and professional football. We'll be updated association website www.uisp.it and will create a photo gallery with all images that will be collected during Modidiali Antirazzisti (edition 2012). All activities of the campaign that have taken place that were funded by the project received visibility through the UISP website, our publications: Stile Libero magazine, in UISP'S weekly newsletter Uispress, and our english version Uispress International. 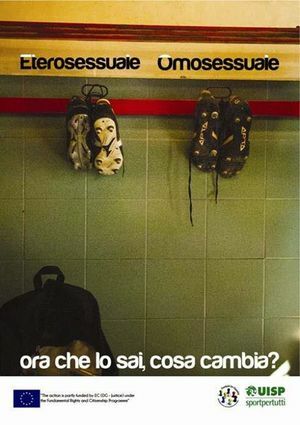 We also try to involve our “audience” by promoting anti-homophobia initiatives in sport clubs, in Uisp member associations thought anti-homophobia campaigns, working in collaboration with relevant public authorities like UNAR – Ufficio Nazionale Antidiscrinazioni Razziali, and with other organizations like Arci gay and Gruppo Pesce Roma.